The quaint parish municipality known as Saint-Joseph-de-Lévis was, at the time Albert Robinson painted this work, a separate and distinct region from the city of Lévis, of which it is now a part. Originally known as Saint-Joseph-de-la-Pointe de Lévy, it became part of the city of Lévis in 2002 but still maintains its rural feel - it has wide streets and many of its original buildings remain intact. 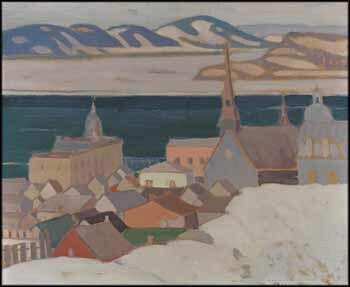 Here, Robinson has painted the parish in winter, giving us a jumble of similarly hued buildings nestled cozily between a snow-covered hillside and the expanse of the St. Lawrence River. Robinson was masterful at depicting snow, using varied hues of pink and blue to touch his whites, which gave them a gentle, appealing tone. In St. Joseph de Lévis, Quebec, he skilfully mixes the colours used to depict the parish buildings into the whites of the snow and the distant shoreline. The result is a harmonious, unified feeling that conveys winter as soft and beckoning, rather than harsh and cold. Additionally, his pastel accents and concordant palette belie the realities of sketching outside in winter. He quickly learned how to work fast to create the feeling he wanted on the panel, rather than to wait for the moment to arrive while he grew steadily colder. Robinson taught Group of Seven artist A.Y. Jackson these practical methods of sketching. The two artists were frequent working companions in all seasons, but for each, winter held particular appeal, as both were similarly interested in the snow-laden rural landscape and, being robust, were generally content to tramp about in the snow. In this fine work Robinson's colour is at its best. The partially ice-covered St. Lawrence River is depicted in a deep blue-green, capturing the glassy chill of a river in winter and accenting the chalky white tones of the scene nicely. The manner in which Robinson has composed the setting adds to the work’s appeal as we look over the snowy crest of the hill and down towards the village, with the river and its undulating shore trailing off into the distance. In addition to their serene beauty, Robinson's depictions of Quebec are historically accurate records of the townscapes at the time, and often we can compare them with the present-day urban landscape. He recorded church spires, cupolas, domes and rooflines with a fair degree of accuracy, and Saint-Joseph-de-Lauzon Church remains much the same today as it was when Robinson painted it. Saint-Joseph School can be seen downhill and towards the water from the church - its cupola and sculpted figure have not changed - and the domed building to the right of the church, now the École de musique Jésus-Marie, still remains part of this urban landscape, largely the same. The small homes and buildings have changed and trees have grown up between them, but the anchoring architecture is much as Robinson recorded it. Robinson has been compared to Canadian Impressionist painter James Wilson Morrice, and this work is particularly evocative of Morrice's colour and compositional methods. Lévis was a frequent subject for both painters, and a love of the lower St. Lawrence River and its quaint hamlets was a steady and recurring theme in their work. In 1926, the consignor's mother was given $125 as a wedding gift from her grandmother. While she was taking art classes at the Montreal Museum of Fine Arts, her class went to Robinson's studio, where she acquired this fine canvas with the money she had received.